What are the top landmarks in Ajaccio? Enjoy the hot Mediterranean weather on this beach nestled between bars, shops and landmarks in the center of town. Enjoy a stop at Ajaccio Cathedral, a landmark worth seeing in Ajaccio. Wander the waterfront and beaches in the area. 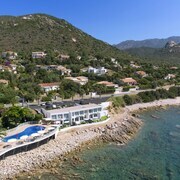 Escape the city with a trip to this picturesque beach surrounded by shops and restaurants on the south coast of Corsica. Look through one of the world’s largest collections of Italian paintings in this elegant museum established by Napoleon Bonaparte’s uncle. Tall palm trees rise around an important fountain in this historic market square in the center of Ajaccio. Very small basic room, renovated bathroom, akward and narrow corridor access to room. Terrific location. It was dated. Just some painting would be very beneficial. Room cleaning could be better. Not filthy, but needs more attention. The birthplace of Napoléon Bonaparte isn’t grand or foreboding – instead, Ajaccio is a charming fishing town with baroque buildings painted in pastel shades, and winding streets named after its famous, all-conquering son. If you’re looking for somewhere relaxing and far from the noisy tourist spots of the Riviera, you’ve come to the right place. Corsica’s popularity with French- and Italian-speaking tourists means that everywhere you go, you’ll experience the exciting variety of a multicultural society. Corsicans speak their own language too, but don’t worry – you’ll find your way in English. Be brave and try out some Corsican phrases at one of the harbour’s trendy cocktails bars, and watch luxury yachts sail in and out of the bay. If you’d like to see Napoléon’s birthplace, head to the old town. Hotels near Maison Bonaparte in Ajaccio are, unsurprisingly, very close to where Napoleon grew up, and it’s still a great area for classic Corsican hospitality. If you’d like to continue strolling, take the Route des Crêtes up into the nearby hills, from which you can find beautiful views of Ajaccio and the rugged south-west Corsican coastline. Or take a trip to the Napoleon family estate to visit the Les Milelli botanic gardens and sprawling olive groves. 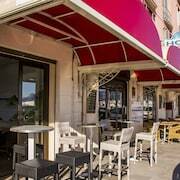 How Cheap Are Hotels in Ajaccio? Ajaccio is the largest city on the island of Corsica, which means it’s also got the largest choice when it comes to accommodation. It all comes down to what you want your holiday to be like. Once you’ve decided on what’s important to you, you’ll find it much easier to pick out>cheap hotels in Ajaccio. For example, if you’re more of a bargain hunter and staying in the countryside near Ajaccio rather than in the city itself appeals, the Hôtel Des Deux Sorru might be perfect for you. Rooms have stunning views of the mountains. 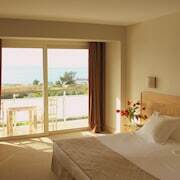 If you’re hoping to stay closer to the sea, Spunta Di Mare has bright, comfortable rooms. The hotel is also close to the airport, so while it’s not right in the centre of the old town, you'll be able to use the reliable, local transport network. If the old town is where you want to be, Hotel Fesch offers tidy, good-value rooms. 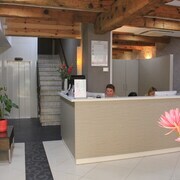 For more cheap accommodation in the city, take a look at our two-star hotels in Ajaccio. Does Ajaccio Have Business Hotels? Being Corsica’s main centre of commerce, Ajaccio sees many business tourists passing through each year. Whether you’re looking for a one-night stopover or a week-long stay, there are hotels in Ajaccio to suit every business traveller’s needs. 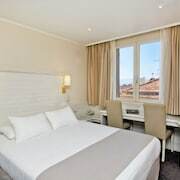 One of the most popular business hotels in Ajaccio is the Campo Dell’Oro> Just a five-minute drive from the airport, this convenient hotel offers luxurious surroundings and large, airy rooms with sea views. If you’re looking for somewhere closer to the action, Hotel Napoleon is set right in the heart of Ajaccio’s historic old town. Instead of sea views, rooms look out over terracotta rooftops, and a business centre and meeting rooms are available to all guests. 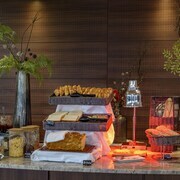 Additional event facilities are also available to book, should you need more space. For a more luxurious stay, the Hotel Dermure Les Mouettes offers the very finest in Corsican beachside location and hospitality. An on-site spa, pool and hot tub will help you unwind after a busy day, and there's a private beach and marina to explore nearby. A laundry service, multilingual staff and airport transfers are all here to make your stay as convenient as possible. Can You Smoke in Ajaccio Hotels? As part of France, the same laws apply to smoking as they do on the mainland. That means you’re allowed to smoke outdoors, as long as you’re not in a public place, or unless there are signs specifically prohibiting you to do so. Much like in the UK, in Ajaccio you are not allowed to smoke inside any public building, including bars, restaurants or cafés. It’s also illegal to smoke in some outdoor areas if they are public spaces – such as a railway station or bus stop. If you’d like to smoke in your hotel, please check that your chosen room is a smoking room. You’ll be able to find this information on each hotel’s Expedia page. Hotels in Corsica are permitted to reserve a percentage of their rooms as smoking rooms, but not all hotels do this, preferring to remain smoke-free. Be sure to check when you book. 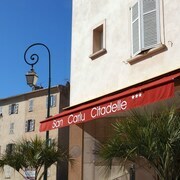 Planning a tour around Corsica after staying in Ajaccio? Take a look at our hotels in Porticcio, a pretty fishing village, or travel south to find hotels in Propriano. Explore Ajaccio with Expedia's Travel Guides to find the best flights, cars, holiday packages and more!